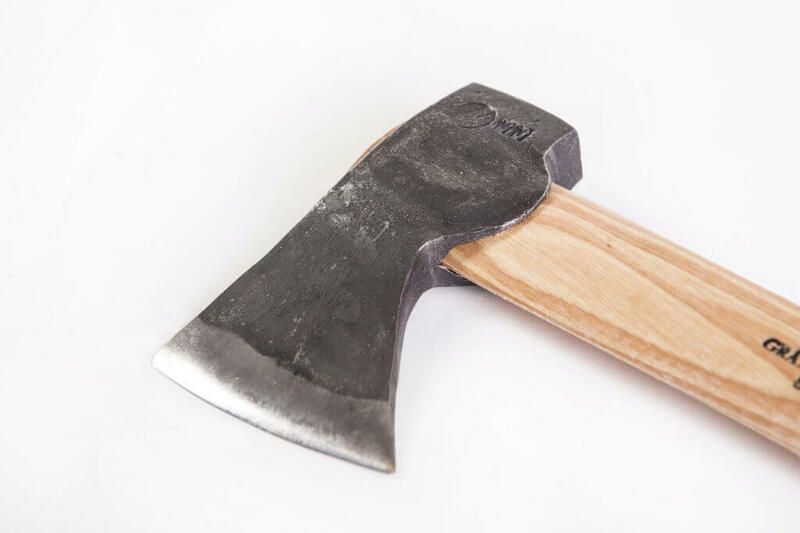 The Gränsfors Bruk Wildlife Hatchet is designed from the ground up as a traditional scouting and camping axe. It’s the perfect size to throw in your pack or tie to the outside. If you don’t read any more of this review, know that this hatchet is a quality handmade tool that functions exceptionally well and I believe it’s the best survival hatchet on the market. 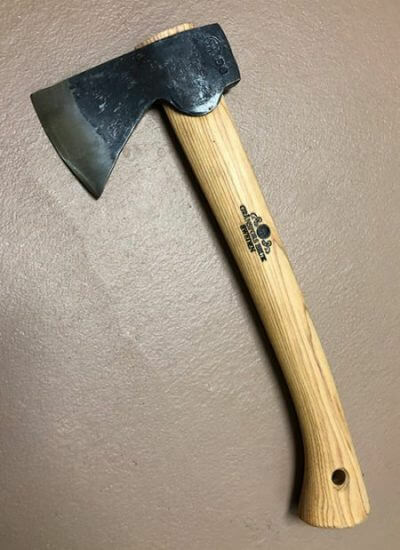 Who Should be Interested in the Gränsfors Bruk Wildlife Hatchet? If you’re looking for a survival hatchet, then look no further, you’ve found what you’re looking for. 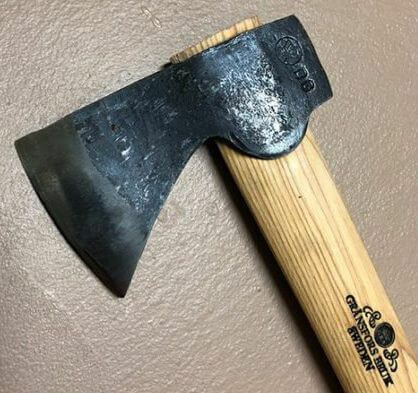 Anyone else that is looking for a hatchet that will stand the test of time is made with quality in mind, and has a great warranty should also consider the Gränsfors Bruk Wildlife Hatchet. The overall length is 13.5″ and it weighs 1.3 lbs. It features a hand-forged steel blade with the craftsman’s initials stamped in the side and a wooden handle that carries the Gränsfors Bruk logo. The entire hatchet is handmade in Sweden. Each hatchet comes with a leather sheath to protect your pack from sharp edges and a small booklet that covers maintenance and proper cutting techniques. Gränsfors Bruk recommends using their sharpening stone when doing maintenance on the blade. The leather sheath is also designed to hang your hatchet from your belt. I usually don’t feel a need to talk about the company of a product that I’m reviewing. In this case, I felt it was interesting enough to include it in the review. Gränsfors Bruks is a small Swedish company that employs 32 people and has been around for more than 100 years. Every axe is handmade and has the craftsman’s initials stamped into the blade to show the pride that the maker has in his work. This gives each axe a really cool, old world, feel. Check out our article The Survival Axe – The Piece of Gear You May Have Overlooked for more of our ideas on uses for the survival axe. Quality is the first thing that you think of when you see a Gränsfors Bruk Wildlife Hatchet for the first time. The blades are razor sharp and show the obvious signs of being hand forged. For some, this may appear as ugly, but to me, it’s a thing of beauty. When you pick it up, the handle is smooth and comfortable and the axe feels well balanced. Of course, if we’re calling this the best survival hatchet out there it needs to chop well. The Gränsfors Bruk Wildlife Hatchet does just that! This thing is a joy to use and makes processing wood easy compared to many other so-called survival hatchets. As with anything, every axe is not perfect. There have been reports of some finishing problems with the handles and a couple people have said they’ve received axes with nicked blades. 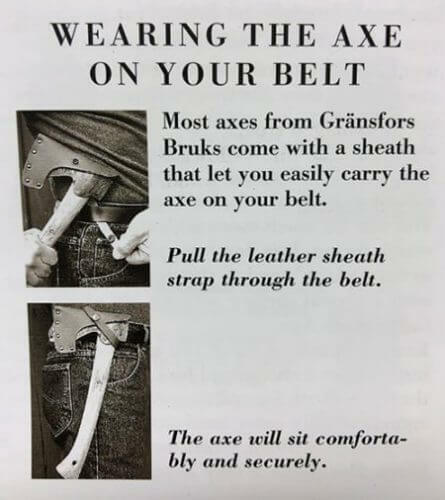 I haven’t personally seen that in any of the Gränsfors Bruk axes I’ve ever handled, but it’s something to make a note of if you’re going to buy one. The good thing is that would be covered by the 20-year manufacturer’s warranty, but it isn’t something you should have to deal with from a product that’s this expensive. I own two Gränsfors Bruk Wildlife Hatchets. One is strapped to my wife’s bug out bag and I take the other one with me when I’m camping or doing something that may require an axe. 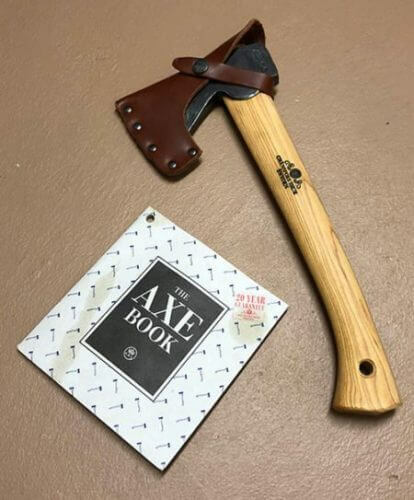 I believe very strongly in the idea of a survival axe and this hatchet fits that role perfectly. Chopping and splitting wood can seem like a chore most of the time. When I’m processing wood for a fire with this hatchet it’s more fun than anything else. Any hatchet can chop wood. A good hatchet makes it fun! We think the Gränsfors Bruk Wildlife Hatchet is the best survival hatchet on the market. Do you have a hatchet that you think outshines the Gränsfors Bruk Wildlife Hatchet ? Let us know in the comments below. Check out our other gear reviews and preparedness articles.